Does Jesus’ “Temple Tantrum” Negate Pacifism and Nonviolence? Indeed it does. And, to be sure, this story, found in all four canonical Gospels, does provide a caution to pacifists against prohibiting all physical violence, much like the Matthean Jesus’ tirade against the scribes and Pharisees provides a caution against prohibiting all verbal violence. But this caution comes with some rather large caveats. First, the point of both this instance of physical violence by Jesus and his uses of verbal violence recorded in the Gospels is the same, and it is crucial to grasp: in each case Jesus is sending a clear warning to the powers that be who are abusing their power over others. They focus on purity over compassion, on strict adherence to the Law over mercy toward the needy, on maintaining their power and privilege over pursuing justice for the vulnerable and marginalized—and this really ticks Jesus off. You won’t find a single instance in the Gospels of Jesus verbally haranguing the poor or flipping the table of a widow—or a little child, or repentant sinner, or seeking Gentile, or any of those considered last, least, or lost in the eyes of the world. Gospels scholars are pretty much united in recognizing that this incident in the temple was a kind of “enacted parable,” or maybe better, a kind of “prophetic symbol.” Jesus overturns tables and drives out animals in the temple courts not because that single action is actually going to halt temple commerce. Undoubtedly everyone picked up their tables, gathered their animals, and carried on with their business. But with this action Jesus served notice to the powers that be—the temple authorities, the watching Roman rulers—that their poor-oppressing and other-excluding ways were under God’s judgment. This wasn’t a “temple tantrum” at all, but rather a deliberate, symbolic act of religious, political, and social activism. Second, this incident does not sanction all uses of any kind of violence even for good ends. The fact remains that this is the one and only remembered incident in Jesus’ entire life and career where he used physical violence. The whole thrust of his teaching and life is against the use of violence and in favour of nonviolent resistance to powers gone bad. So, although this incident allows the possibility of Jesus-followers to use physical violence to send a message to the abusive powers that be, this is not the norm and must be done carefully, thoughtfully, and probably only as a last resort (as it apparently was for Jesus, John’s order of events notwithstanding). Furthermore, the Gospel accounts of the incident do not give warrant for physical violence against human persons, let alone lethal violence of any kind. 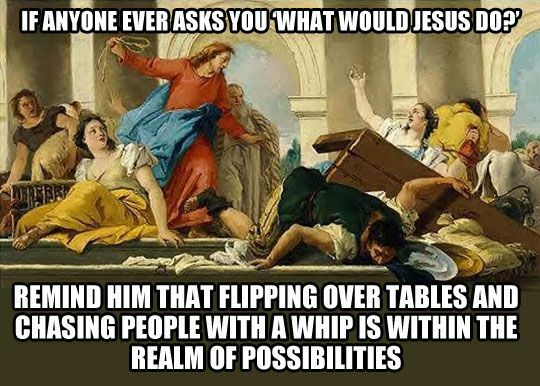 The only clearly described physical violence is against property: Jesus “overturned” the tables and chairs of the sellers and moneychangers, and “poured out” their coins. Yes, Jesus “drove out” the moneychangers and “would not allow anyone to carry anything through the temple,” but the Gospels don’t say how exactly Jesus accomplished this. Was it his table flipping that drove them out? His verbal tirade? Maybe his “wild-eyed prophet” look, borrowed from his Baptist cousin? We don’t know. In John’s version, yes, Jesus makes a whip, but the whip is not used against people—the text specifically says it was used to drive out the “sheep and the cattle” (pantas exebalen ek tou hierou ta te probata kai tous boas). So yes, by all means, let’s take Jesus’ tirade in the temple into account when we’re considering a Christian pacifism or Christian nonviolence. Let’s allow it to provide a necessary caution against a kind of “pure nonviolence” that can turn into passive acceptance of evil or self-righteous denunciation of all forms of violence. But let’s also read the Gospel accounts of this story carefully, and let’s set this single remembered incident of Jesus’ use of physical violence—nonlethal, against property not persons—in the context of a whole life and teaching that is consistent in emphasizing justice through nonviolence, peace through selfless love.